During the past three days Pi Tui and our intern Charlaine went on a trip to Surat Thani at the invitation of the Tourism Authority of Thailand (TAT). The TAT is an organization under the department of tourism and sports that promotes Thailand to (potential) visitors. They do this in many different ways and organizing promotional trips is one of them. From the 10th through the 12th of June the TAT hosted the “TAT FAM trip” or the “TAT Familiarization trip”. This trip had the goal to promote Community Based Tourism (CBT) in Surat Thani province. Tour agents from various regions in Thailand were invited to experience some community based attractions in Surat Thani. Besides us, employees from the following companies joined in on this the trip: TRTA, Siam Rise, Khiri travel and Local alike. Two employees from the TAT office in Surat Thani accompanied the group and showed them their province with a lot of enthusiasm. During the three-day trip we were introduced to many different CBT projects in and around Surat Thani. The trip started on the first day with a visit to a coconut oil factory. 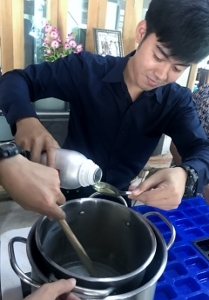 This family run business makes different products from coconut oil such as shampoo, body lotion, soap and cooking oil. During our visit the son of the owner told us all about the history of the business; the local area and the many different products they sell. They also demonstrated us how their soap is made. At the end there was some time to buy all the products in their little on site shop. On the second day the group visited an island together with a local fisherman that works hard to preserve this island and the crabs that live there. The island forms an important source of life for many sea creatures. We helped the fisherman to plant coconut trees, release crabs and search for clams. After that we went to the fisherman’s house to enjoy a home cooked lunch (with of course a lot of seafood). 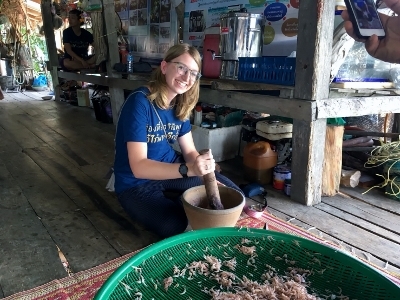 We also learned how to make shrimp paste there. This is an important ingredient in many Thai dishes. On the same day we visited a town where some women still weave by hand. Machines are taking over this traditional craft though and the village has a big weaving factory now where machines are used to make many different products such as scarfs. The last attraction we visited that day was a farm land where two businesses work together to organize homestays and tours. The first business makes preserved duck eggs and the other business is a rice farm that cultivates many different types ofrice. When visiting this farm you can learn everything about these two different crafts. 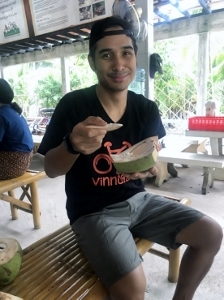 On the last day we visited a local village just outside of Surat Thani. Different villagers contribute to the Community Based tourism program there. 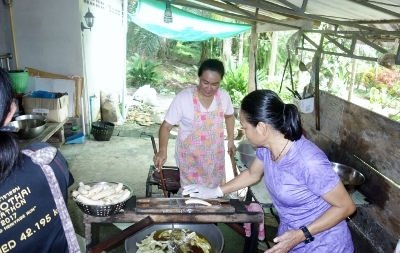 Some of the villagers open up their houses to let people stay in their homes and others teach visitors a craft such as soap making; tie dye or making banana chips.